Well, I now have to wear this device each night. But life as an idle layabout is not so bad, and it's only for 30 days. Your emails and letters and even flowers (from as far away as Shanghai!) have been just wonderful. Catherine, who is running the opera company along with members of my family and the intrepid Ratana and Noo, is rather astounded at the sheer volume of what I used to have to take care of each day before getting to the creative work; after a week, she's already casting around wildly for a team of volunteers or ersatzSomtows. And I'm hearing from friends I haven't talked to in absolute years ... here's what Alan Dean Foster says to me: "I get a chuckle out of envisioning you, of all people, after all the creatures and critters you've dealt with in your work, being terrified of something as prosaic as an MRI" … and Marti McKenna has just told me that her "baby" is now 25 years old. At least most people are seeing the possibilities for comedy in all this as well; I would hate to depress anyone; indeed, I am planning my funeral as a stand-up comic routine, with Trisdee's Requiem as a sort of intermission piece. (It will be pretty funny when my corpse stands up; it will have to be rigged with 1980s style special effects hydraulics, like the pizza of death in Nightmare on Elm Street III). 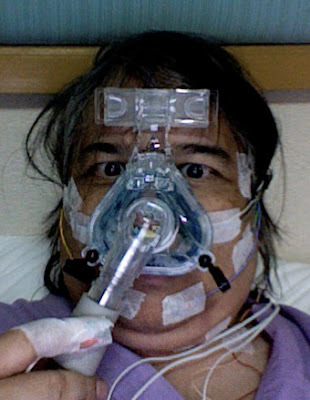 I must say that the apnea-controlling device itself is a nuisance. In my sleep, I often end up unhooking it. There must be a nice Greek-derived medical term for people who unhook themselves from medical apparatus in their sleep. If there isn't, with my trusty Greek dictionary in hand, I'll just coin one: autohypnoekiatromechanoapankistronysis. Who says I've lost my touch at creating catchy new words? Well, now that I am back home at least for a few days (the lab may require me for more medical experiments on Monday) knowing that I'm allowed to work as long it is on creative things and not stressful organizational things, I've already written the first five chapters of a new fantasy trilogy set in Bangkok which is a sort of cross between Bangkok 8 and Harry Potter. You may not think this possible, so we will just have to see. I'm hoping to do for Bangkok what Neil did for London (or maybe what Emma and Will did for Minneapolis!) By the way, if any of you have read both Will Shetterly's novel Dogland and my novel Jasmine Nights, you will know that he and I had exactly the same childhood -- 12,000 miles apart. It is one of those extraordinary things. But what of the opera? Well, it is not exactly running itself, but one thing that is occurring as a result of all this is that it is learning to run itself. Whether it will complete the learning curve within 30 days is an unknown quantity, but circumstances are forcing our hand and it had simply better learn. I do of course have a new opera in the works, Dan no Ura, and I had to give up the premiere in order to place Die Walküre within this calendar year. I am not currently suffering from composer's block, so we will simply have to see how the return to two creative streams can play out. I'm proud because this visiting young trumpet player from Belgium, Stan Nieuwenhuis, showed up in Bangkok (he was supposed to play in the Wagner, but he's come anyway in order to have his holiday) and I took him for a tour of the notorious software stews of Bangkok; I stayed on my feet for four hours without getting tired and I think they had a great time; though now I'm feeling a huge fatigue.